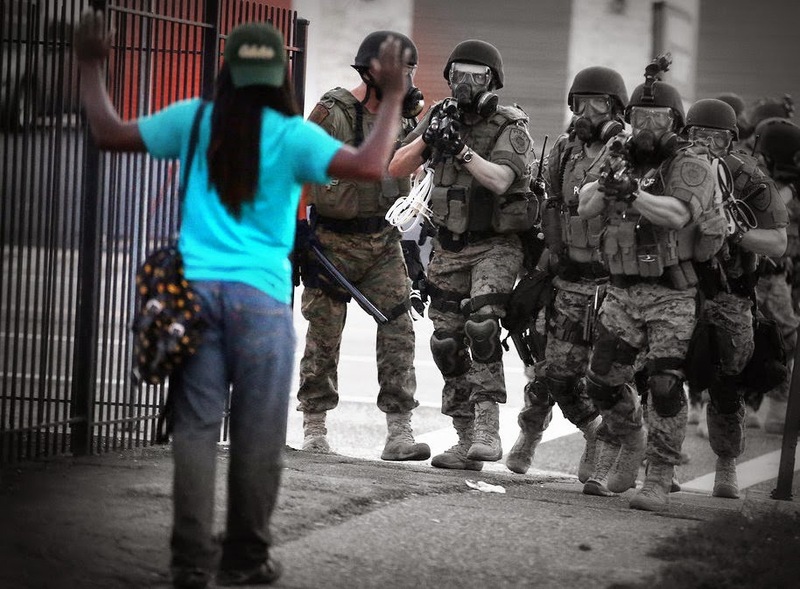 The Ferguson Lesson: Another Way to "Take Up Arms"
As someone who has spent the better part of her career researching, analyzing and teaching not only about the structure and nature of oppressive power regimes, but also better and worse ways to resist or transform such regimes, I've nevertheless been unable to settle in my own mind, to my own satisfaction, my position with regard to the moral or political value of revolutionary violence. I can say that my core moral intuitions (for whatever those are worth) definitely incline me toward favoring nonviolence as a principled ethical commitment... though, over the years, I have found those intuitive inclinations fading in both intensity and persuasiveness. As a philosopher, a citizen and a moral agent, I continue to be deeply unsettled by my own ambivalence on this matter. First, a preliminary autobiographical anecdote: I spent a year between undergraduate and gradate school in the nonprofit sector, as the Director of the M.K.Gandhi Institute for the Study of Nonviolence. (That was back in 2000, when the Gandhi Institute was still housed at Christian Brothers University in Memphis, which is now my academic home, evidencing the kind of bizarro turn-of-fate that can only be credited to some particularly clever-- or ironically humorous-- supernatural bureaucrat.) I went to the Gandhi Institute initially because nonviolence was an all-but-unquestioned moral virtue for me at the time. But, after a few years in graduate school and consistently since, the many and varied until-then-unposed questions about the moral or political legitimacy of violence pressed their way to the fore of my mind. In roughly chronological order, I'd say that the combination of (1) my first real engagement with Frantz Fanon's argument in "Concerning Violence" (from his Wretched of the Earth), the arguments by Marx (and Marxists) in various texts advocating more or less violent revolution, and Noam Chomsky's considerations of the same, (2) my extensive research into human rights violations, transitional justice and transitional democracies, postcolonial theory, feminist theory and critical race theory, which collectively constituted the subject of my dissertation, (3) the radically dramatic shift in what counts as properly-speaking "political" and/or "revolutionary" violence in the post-9/11 world and (4) my own experiences, from near and afar, with the increasing number of (threatened, proto-, aborted, defeated and/or more-or-less successful) revolutions taking place in my adult lifetime (e.g., OWS, the Arab Spring and, much closer to home and far less violent, the current and ongoing academic revolution surrounding the Salaita case), all worked together to contribute to my rethinking the merits and demerits of violence as a way of resisting/combatting/correcting oppressive, exclusionary or otherwise unjust power regimes. The news has just been released that Rev. 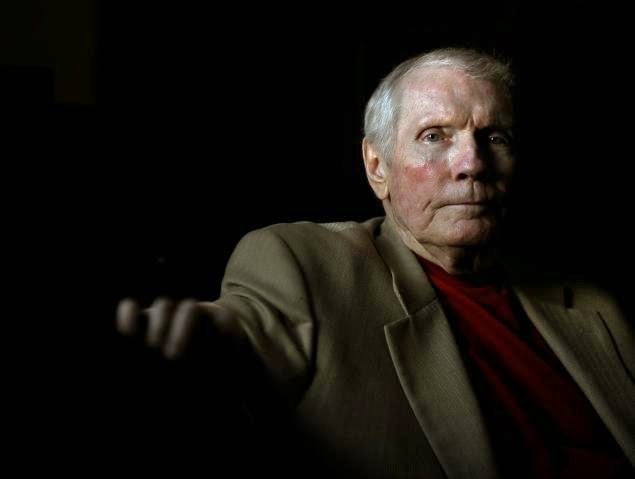 Fred Phelps, founder and lifelong shepherd of the Westboro Baptist Church (in Topeka, Kansas) has died at the age of 84. I find it difficult, I confess, to summon the normal human compassion that usually accompanies news of another's death in this case, largely because Phelps dedicated his life to broadcasting his rejection of-- not to mention enlisting others, including children, to stage carnival-like circuses around his rejection of-- what most people would consider even the most minimally-decent exhibitions of human compassion. Fred Phelps was one of the most infamous, outrageous, dishonorable and genuinely despicable hatemongers of my generation. And, what is more, Fred Phelps' hate was as ferocious and vicious as it was blind. Through the prism of his delusional and evangelical abhorrence, the Westboro congregants en masse considered themselves justified in casting an unjustifiably wide net of Judgment. Caught in that net were many: ranging from bona fide innocents against whom no reasonable person could or ought cast aspersions, like Matthew Shepard, to a whole host of other "collateral-damage" victims of Phelps' quasi-political positions who found themselves the inadvertent and inauspicious targets of his his flock's detestation. I say again: I find it very, very difficult to summon the normal human compassion that ought to accompany the news of Fred Phelps' passing. Nevertheless, these are the moments when our inclination toward Schadenfreude, however deeply affirming and deeply satisfactory indulging that sentiment may feel, ought to be on principle squelched. Eric Schliesser on "Lice and Biopolitics"
Schliesser thought he could escape the Borg, but a senior philosopher elsewhere has tracked him down for us here. In this very interesting reflection, he writes about the head-lice inspection all Dutch kids undergo at school, and connnects it to Foucaultian analyses of biopolitics (or, with less fancy terms, that government rationality that licences, among other things, involvement in public health). But, as Schliesser recognizes, it's hard to be simply "against" public health -- what, you *want* your kids and other kids to have lice? Anyhow, when I scrolled to the bottom of the popup, I had to click a button saying not only that I read the document but also that I "agreed" with it. I honestly don't get this. Are my beliefs a condition of employment at LSU? There was no button that said I read it but didn't agree with it. The English Bill of Rights (1689) expressly forbids ""cruel and unusual" punishment, and this found its way into the U.S. Constitution. One important, enduring argument against such punishment -- and many other forms of cruelty that may not, in fact, constitute 'punishment' -- can be found in Seneca's Letter 7: viewing and otherwise participating in the degradation and cruelty of others, even in the context of justified punishment [ille meruit ut hoc pateretur], can harm not just the victims or punished, but perpetrators and spectators alike. This is especially so if the cruelty produces pleasure as it is likely to do at public spectacles [spectaculo]* because then this pleasure makes our soul receptive; a desire for more cruelty creeps up on us [per voluptatem facilius vitia subrepunt]. Some public HE students go into debt in part in order to participate in collective joy and thereby compensate for the negative affects of indebted life. Let me explain, and in so doing tie some things together in and around some favorite themes: student debt as feature of neoliberal HE, political affect, and the grotesque nature of the NCAA. The NFL recently settled a lawsuit by former players for $756 million for witholding evidence of the dangers of football-related brain injuries. There's a lot to say about this issue, but I'll limit myself to this: the contribution to CTE (chronic traumatic encephalopathy) of very numerous sub-concussive hits sustained in practice (as opposed to the specactular* and relatively rare concussions in games) is under-played in the media. But here's a disturbing angle: the NFL now limits live contact practices more than does the NCAA. Evan Selinger has an important piece up at Wired on the way social media are constructing mood graphs based on our use of emoticons. We already know that with a social graph at its disposal, a mood graph would give Facebook an incredible edge over its competitors for customizing ads and recommendations, as well as predicting users’ future feelings. But consider this: Even if you’re someone who doesn’t share anything, Facebook could potentially reverse-engineer your emotional persona by filling in the blanks from your like-minded friends’ emotional states. In other words, the more your friends emote and translate their soulful moments into basic data points, the more Facebook can determine what makes you tick, too. In short, thanks to persuasive interface design and non-transparent algorithms, we may be providing emotional labor without even knowing it. Couple the social media framing and exploitation of self-offered emotional labor with the construction of "soft skills" profiles from MOOCs and we see some of what the Autonomia people are after when they talk about the social factory. You'd literally have to change the human genome to stop wealth discrepancy.... We have biological systems built into us that were very advantageous for us, up until we became a functioning civilisation 10,000 years ago. We are literally genetically coded to preserve life, procreate and get food – and that's not gonna change. The question is whether you can somehow overpower certain parts of that mammalian DNA and try to give some of your money out, try to take your wealth and pour it out for the rest of the planet. In The Evolved Apprentice Kim Sterelny claims there has been an over-estimation of the difficulty of cheater detection in small groups. (Hence he is not a supporter of Machiavellian Intelligence theories alone; in fact, cheater detection is less demanding than coordinating cooperation [2012, 7-10].) The real issue for him is to explain how cooperation in complex tasks works. His answer, apprenticeship, is fascinating in its own right, but what I want to concentrate on here is the way in which at the end of his book Sterelny poses the question of functionalism, or if you prefer, the Spinoza question: why do people go along with hierarchies when they are at the bottom – or at least not at the top? to my post (part I), here at BHL. Ta-Nehisi Coates: "I think the message of this episode is unfortunate. By Florida law, in any violent confrontation ending in a disputed act of lethal self-defense, without eye-witnesses, the advantage goes to the living. An intelligent, self-interested observer of this case, who happens to live in Florida, would not be wrong to do as George Zimmerman did--buy a gun, master the finer points of Florida self-defense law and then wait." Link 1: Zimmerman had in fact studied the self-defense law, despite initial denials. Link 2: ALEC's role in getting copies of the Florida law into other states. Link 3: The NRA's lobbying of legislatures in Florida and other states. UPDATE: 14 July, 10:30 am CDT: Results of states adopting such laws. UPDATE 2: 14 July, 2:40 pm CDT: Scott Lemieux on the role of self-defense laws in the trial; (Stand Your Ground was not in fact invoked in the Zimmerman trial but rather simple self-defense). UPDATE 3: 15 July, 11 am CDT (see below). On Saturday [1 June] there was a back and forth struggle with the police all day, but they backed off around 3PM, largely thanks to the Beşiktaş soccer team’s ultra fans, Çarşı. They maintained a solid front before the tear gas and police. Their steady patience at the front line kept those us of behind them in place up until the police retreated. Then, we all rushed into the park shouting ideological slogans. The feeling of walking back in was amazing, powerful…. It’s a standard thing to walk in a park. You know, “It’s like a walk in the park,” the saying goes, but the effort here transformed it. To be with those thousands of people taking control of our urban space, our park, in our city came with a sense of communal empowerment I’d never felt. Facebook was awash with jokes yesterday poking fun at McGinn and his defenders. (You know who you are! ["you" = the jokesters and the defenders]) Taking off from the original Defense of Snark, I would like to defend mockery in the McGinn case as an important means of norm enforcement. In other words, mocking the inanity of McGinn's defenders with their "out of context" or "he was just conveying the results of his research" maneuvers does two things I think: one, it ups the social cost of traditional defenses of the indefensible, and two, it sends a message of encouragement to those thinking of pressing charges but worried about what the defenders of the accused will say. As some of you may know, Niall Ferguson engaged in a bit of gay-bashing yesterday (links below), holding that Keynes wouldn’t have cared about future generations because he was gay (the point is apparently taken from Gertrude Himmelfarb: see the Delong item referred to below). Now he has apologized. 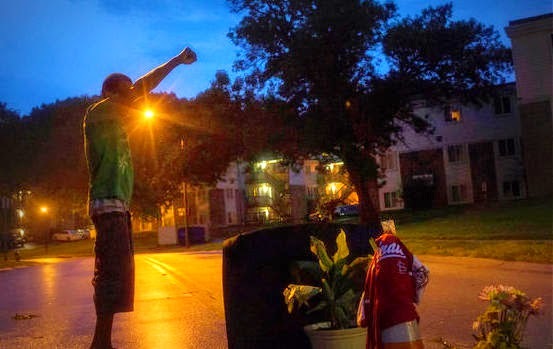 In my view no one is obliged to accept an apology: should we accept Ferguson’s and move on, as they say? Henry Blodgett at Business Insider was one of the first with the story. Tom Kostigen at Financial Advisor also reported on Ferguson’s remarks. Brad Delong has the Himmelfarb connection. Other comments by Kathleen Geier and Paul Harris (a bit of a whitewash: note that the headline and the story both emphasize the apology), at the Guardian (to which Ferguson is a contributor). It is not to minimize the horror of the Boston bombings -- indeed, it is to highlight it -- that I point to the difference between media coverage of Boston and that of the West, Texas explosion. The former was roughly 24/7 on the big cable channels, with some coverage of the Texas explosion. But then when you look to the road fatalities stats, you realize there's something amazing when 30,000 deaths a year doesn't gain any national news at all. So what's going on? Some observations below. Following up on last week's post on sessions at the APA Central, today I want to link the book sessions on Cordelia Fine's Delusions of Gender and on Jesse Prinz's Beyond Human Nature. The central issue of Fine's book, and one of the key ones of Prinz's book, is the role of social experience in accounting for gender variability in behavior and in neurological function. I think the discussions in the books demonstrate a slogan of mine, that "our nature is to be so open to our nurture that it becomes second nature. "* What I mean by this is that we are "bodies politic," that is to say, due to our neuroendrocrinological plasticity, social experience will shape our bodies in accord with the subjectification practices in which we participate more or less consciously and willingly. Experience goes deep, you could say, right down to the brain's neurons and hormones. But there's a variation in that depth, I think; some depths are deeper than others. Among the great early Modern thinkers, Hobbes famously emphasizes the role of fear in the state of nature in prompting the agreement to form the civil state—and fear of a return to the state of nature once in such a state. The reason we must be afraid in – and of – the the state of nature is the widespread ability of people to kill each other; while asleep, even the strongest can be killed by the weakest (Ryan, 1996; Foucault, 2003; Hull, 2009; on the general relation of reason and passion in Hobbes, see Coli, 2006). The other great early Modern thinker whom we will treat is Spinoza. It turns out that most trauma victims — even survivors of combat, torture or concentration camps — rebound to live full, normal lives. That has given rise to a more nuanced view of trauma — less a poison than an infectious agent, a challenge that most people overcome but that may defeat those weakened by past traumas, genetics or other factors. Now, a significant body of work suggests that even this view is too narrow — that the environment just after the event, particularly other people’s responses, may be just as crucial as the event itself. But in villages that readily and happily reintegrated them (usually via rituals or conventions specifically designed to do so), they experienced no more mental distress than did peers who had never gone to war. The lasting harm of being a child soldier, it seemed, arose not from the war but from social isolation and conflict afterward. Contrast* the social integration approach to an individual pathology approach, using cognitive behavioral therapy and / or SSRIs to handle symptoms or beta-blockers to intervene in memory formation (another h/t to Greg Downey for this link). As M.P. notes here in comments on Mohan's post, there is an undercurrent of thought (using the term lightly) that defends absolutist interpretations of the 2nd Amendment by claiming that widespread ownership of guns (sometimes specified as assault weapons) serves as a last line of defense against "tyranny." Below the fold, I mock a particular expression of this idea, which showed up at a blog I frequent, Lawyers, Guns, and Money. I also make a few serious points.